Specialized in Ophthalmology at the General Hospital of Athens ‘G.Gennimatas’. One of the founding members of the Hellenic Society of Refractive Surgery. The society later merged with the Society of Implanted Intraocular Lenses to form the Hellenic Society of Intraocular Implant and Refractive Surgery. Hellenic Society of Intraocular Implant and Refractive Surgery. 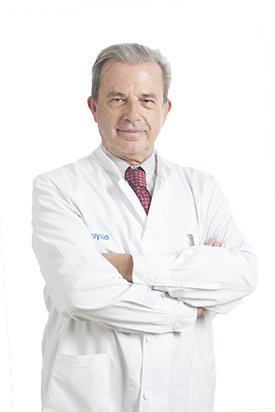 He has been consulting since 1989 at the Research and Therapeutic Eye Institute ‘OPHTHALMOS’ and at the Hospital ‘Hygeia’ in Athens where he developed a special interest in laser eye surgery and in the diagnosis and treatment of retinal and macular diseases (medical retina). He has been one of the first Eye Surgeons in Greece (1992) to use laser in refractive surgery for the correction of myopia, hyperopia and astigmatism and he has performed thousands of laser eye surgeries. He has also trained many junior Ophthalmologists in this field. Invited speaker and instructor in Ophthalmological Courses and Wet – labs.